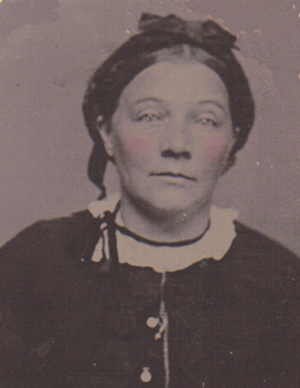 Elsa's grandmother Ella Lorena Rowe grew up on a farm in the frontier town of Wilson, Kansas. In 1883, when Ella was 9, she visited some of her mother's family in Lafayette County, Wisconsin. She took with her a Keepsake Book. During the next two years she carried it with her on other vacations, including a trip to visit some of her father's family in Franklin County, Iowa. 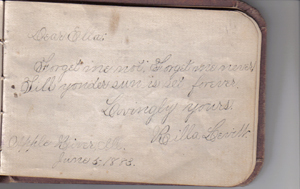 We found the hundred-and-nineteen-year-old keepsake book in her daughter-in-law's old trunk in Pepper Pike, Ohio, where it had passed to one of Ella's great-granddaughters. Hover your mouse pointer over a picture to see the identification. This is the cover of the Keepsake Book, next to the earliest photograph of Ella we have, taken at her high school graduation. Although primarily intended for Ella, the Keepsake Book was used occasionally by her sisters Leona and Verna. 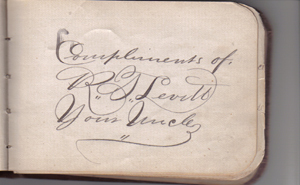 We have shown just those few inscriptions for which we can supply a photograph of the person who wrote the entry. These are Ella's parents, Thomas Hancock Rowe and Sarah Jane Levitt. Although neither of them signed her Keepsake Book, Ella felt very close to both families all her life. Her father was one of eight children, and her mother one of nine children, so Ella had plenty of aunts, uncles, and cousins. Ella's maternal grandfather, Richard Levitt, was born in Little Weighton, in the East Ridings of Yorkshire, the tenth of eleven children. 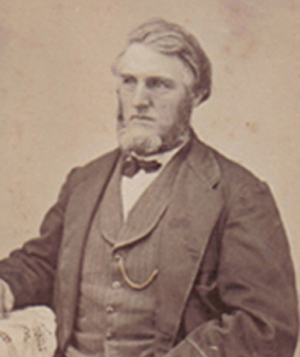 In 1831, when Richard was 8, his father and two oldest brothers emigrated, first to Wood County, Ohio, and then to Lafayette County, Wisconsin. Eventually 9 of the 11 children settled in this rich farmland just north of the Illinois border. 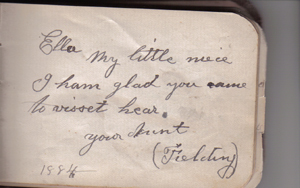 Richard's message sounds stern -- to properly awe a small granddaughter. 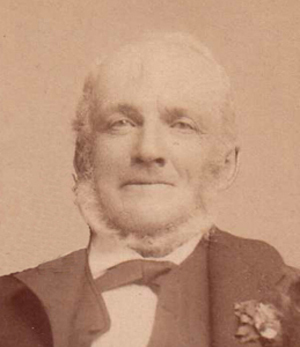 Ella's paternal grandfather, William Rowe, worked as a miner near St. Austell, Cornwall. He may have been an only child, as we have found no records of siblings. After his father died, William cared for his mother, who lived to be 89 years old. 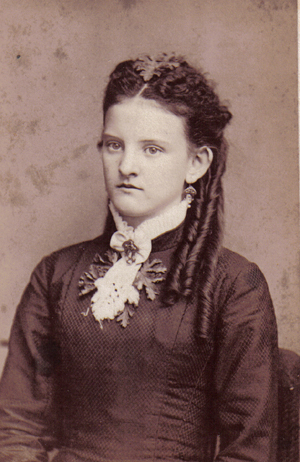 Shortly after her death, William and his oldest son, Thomas, travelled to America. They found mining work in Wilkes-Barre, Pennsylvania, and brought the rest of the family over the next year. They moved for a short time to Lafayette County, Wisconsin, where many Cornishmen were mining lead, but William soon was able to purchase land in Iowa, where he became a farmer. His son Thomas met his future bride in Wisconsin. 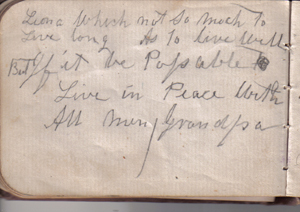 William's inscription in the Keepsake Book expresses some noble feelings. Ella's Great Aunt Harriet was the youngest of Richard Levitt's siblings, who unwittingly provided us the keys to the Levitt family history. 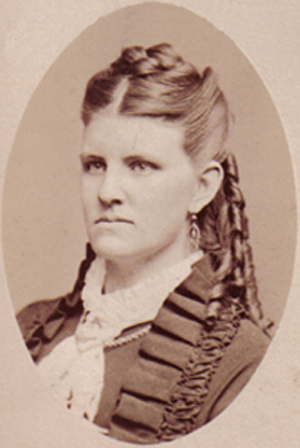 Harriet married George Fielding, but had no children, and her will named all her nieces and nephews, in England and in the United States, as legatees. She wasn't a very good speller. 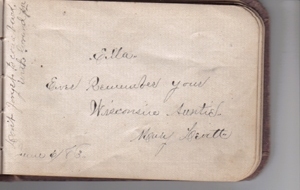 Mary Adelaide Levitt was just 15 when she signed her niece's Keepsake Book. 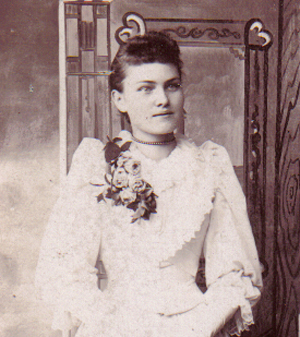 Later she married John Alexander Lamont, who ran a farm supply store in Apple River. He carried large inventories of fencing, cook stoves, furnaces and livestock equipment. He specialized in tin work and raised seamed roofing. A century later we met her grandsons Gordon and Oliver Lamont who shared their memories along with albums of family photographs. In the margin she wrote, "Don't forget to come back with grandpa." By 1883, three of Richard Levitt's remaining 7 children had homesteaded in Kansas and were prospering. Richard's bones may have ached in the cold Wisconsin winters. 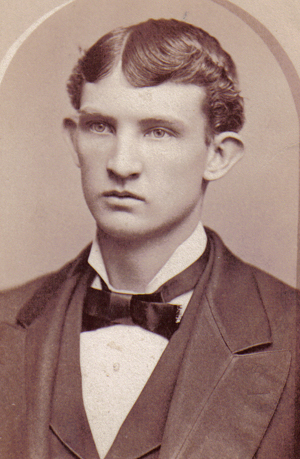 He moved to Kansas where he died in 1900. But he and most of his family are buried in the family plot in the West Ella Highland Cemetery. The cemetery was a gift of Richard Levitt and his brother Robert, and was named after the region of Yorkshire where they grew up. It's just a short walk north of the town of Apple River, Illinois, and most of the former citizens of Apple River are buried there. 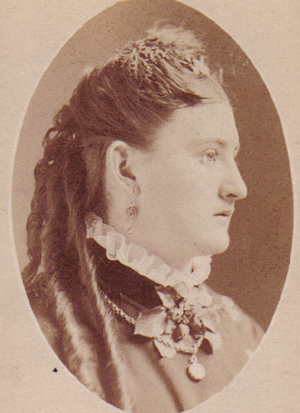 In addition to a Great Aunt Harriet, Ella had an Aunt Harriet - her mother's sister, who remained in Wisconsin and married George Greenough in 1885. Harriet Greenough had two daughters, named (rather unconventionally for the time) Birdie and Lulu. Hattie's message was signed at Monticello, Wisconsin, which was not a town but a farming township, neatly divided into 36 square-mile sections. Most of the farmers then owned one or more 160-acre quarter sections. Oliver Lamont told us that these days one farmer might work 3,000 acres or more. 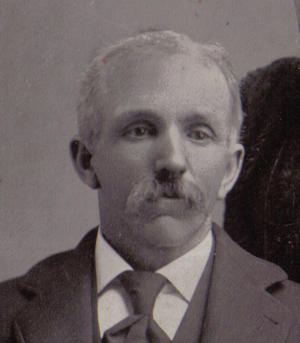 Ella's Uncle John E. Levitt became a famous family character, because he never moved from the family farm from the day of his birth to the day of his death, more than 98 years later. And he farmed all his life. Elsa Pendleton remembers her grandmother Ella remarking, in 1952, that Uncle John (then 90) had to hire a new hired boy, because the last one had gone off to live in an old folks' home! Uncle John had one daughter, Isola Levitt, who lived at home with her parents and never married. Staying put was clearly considered a virtue. 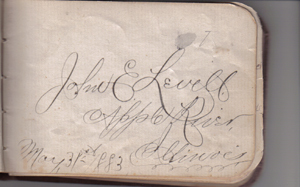 John E Levitt filled the page with his elaborate signature. Ella's youngest uncle was Richard Thomas Levitt, who went by "Tom." 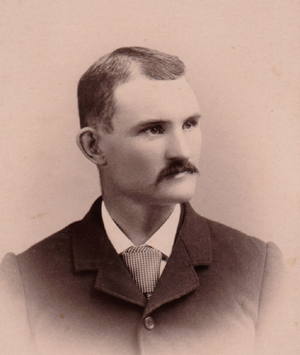 He moved to Kansas and went into business with his brother George, farming and running a department store in Wilson. George married at age 43 (his wife lived to 108) but Tom remained single, and, faced with bad health and business reversals, Tom committed suicide with a shotgun in his sister Sarah Rowe's home in Wilson in 1922. 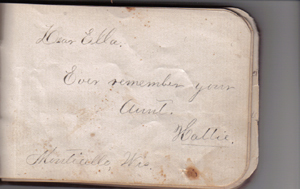 At the time, though, Uncle Tom signed a bold confident message to Ella. Richard Levitt's three youngest children all died young. James Levitt died as an infant in 1864; Margaret Levitt died in 1870, age 3; and Esmarilda (Levitt) Irvin died in 1895, age 29, leaving an infant daughter. She died in Kansas while visiting her parents, but her body was later reburied in West Ella Highland Cemetery in the family plot. 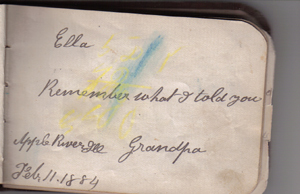 Esmarilda was 17 when she wrote her note to Ella: Forget me not; Forget me never, Till yonder sun is set forever. Lovingly yours, Rilla Levitt. 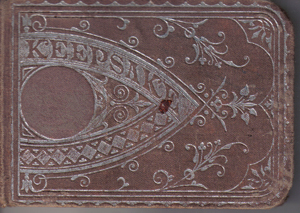 Most of the entries in the Keepsake Book were dated 1883-1885, when Ella was age 9 to 11. She must have put it aside then, kept in a drawer in her room. 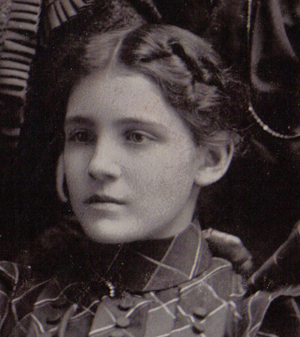 In 1895, Ella was 21 years old, a schoolteacher living away from home in a boarding house in nearby Ellsworth, Kansas, still unmarried, but with someone in mind. 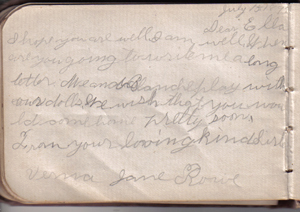 Her kid sister Verna was just 9, though, and happened to find Ella's Keepsake Book and decided to make her own entry. July 15, 1895. Dear Ella, I hope you are well. I am well. When are you going to write me a long letter. Me and Blanche play with our dolls. We wish that you would come home pretty soon. From your loving kind sister Verna Jane Rowe. And what became of Ella Rowe? Like some of her descendants, she was a tiny woman, not much over five feet tall. 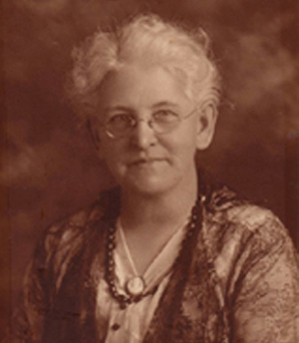 She had fallen in love with Charles Cadwell, a six-foot-three inch man who had been her own high-school teacher, and then became a professor of engineering at the Case School in Cleveland, Ohio. She saw him whenever he returned to Kansas to visit his family. In 1898 Charles went off to Mexico to mine gold and silver, but he wrote her a letter promising to return and marry her. On 25 Jan 1900, when he was 29 and she was 25, Charles Cadwell and Ella Rowe were wed at her parents' home in Wilson, Kansas. They left Kansas in a hurry, for their formal wedding pictures were taken not in Kansas, but in Cleveland, but Ella remembered to bring her Keepsake Book. 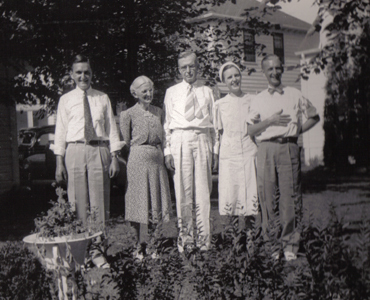 Charles and Ella had three children, and their daughter Sara Cadwell married Roy Walther and they had two daughters. Fifty-eight years to the day after her grandmother's wedding, on 25 Jan 1958, one of those daughters, Elsa Walther, married Robert Pendleton in Rocky River, Ohio. And the family story goes on.